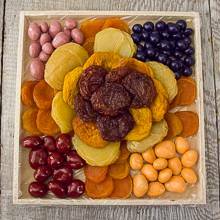 Sweet meets sweeter in our most popular dried and chocolate covered fruits crate. It's a scrumptious crate that makes a great gift for someone special. Packaged in a wooden crate. Net wt. 2 lbs. Ship wt. 3 lbs.